Welsh Guards veterans of the Falklands War have held a service to mark the 25th anniversary of the bombing of the troop ship Sir Galahad. A total of 48 men, most of them Welsh Guards, were killed when Argentine jets attacked the ship on 8 June 1982. Around 30 members of the South Atlantic Medal Association gathered at St Mary's Church in Swansea. Meanwhile, it has been announced that Wales' memorial to the war's 255 UK victims will be unveiled in September. The destruction of the Sir Galahad by Argentine Skyhawk jets came just six days before the Argentine surrender. The bombing accounted for one fifth of all British fatalities, many of them Welsh Guardsman preparing to go ashore and join the land war. Falklands veterans remembered those who lost their lives on the Sir Galahad, 25 years ago. Twenty-five years on, Welsh veterans attended a remembrance service at St Mary's Church which has a stained glass window depicting the bombing. The service, beneath the window at the north end of the church, included elements of the original 1982 memorial service for victims of the attack. It included the playing of the Dire Straits song, Brothers in Arms, which has a special significance to the veterans. The Rev Andrew Vessey, who led the informal service, spoke of the fallen comrades and those left stricken with memories, who continue to suffer. Rev Vessey said men had "given their lives in the teeth of battle for a group of islands where people wanted to live in freedom". Afterwards, one of the veterans Rob Nicholls said: "We were quite amazed at the numbers who turned up, there were 25 to 30 guys." 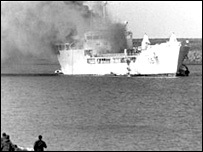 A memorial service will also be held later at Fitzroy on the Falklands. A commemoration of the conflict in Cardiff has also been announced for 30 September, which will include the unveiling of a Welsh national memorial to the British fallen. A significant part of the memorial will be a five-tonne rock given to the Welsh veterans of the conflict by the people of the Falklands. The stone was brought from Mount Harriet, a battle site where Welsh Guards supported the Royal Marines. 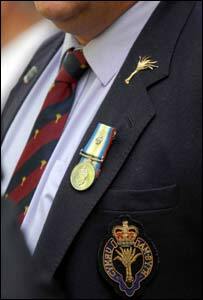 The stone was chosen by Andy Jones, secretary of the South Atlantic Medal Association in Wales, who was a 19-year-old Welsh Guardsman on the Sir Galahad on the day of the 1982 attack. He said: "It means an awful lot to all the veterans to see their comrades' names on a national Welsh memorial. "Most veterans who were aboard or knew people aboard the Sir Galahad mark 8 June in their own way. "It's quite an upsetting date in their calendar. Some of them certainly will be suffering today - more so than usual." Mr Jones, now a prison officer in Cardiff, said of the bombings: "You were picked up and thrown like a feather in the wind. Every bit of breath was forced out. "There was a huge orange flash and the heat was coming through your eyes. It was like needles." The Falklands War cost the lives of more than 650 Argentine and more than 250 British servicemen and women. What are UK troops doing there?